Following the film, Stockwell and Hopper engaged in a candid and most intimate Q & A in which they talked about everything from The Boy With Green Hair to their appearing together in David Lynch's brilliant Blue Velvet. They were both humble and clearly in love with their craft. Stockwell even spoke about Quantum Leap which was met with a huge round of applause. He said that when he took on the role of Al in the cult hit TV series, Hopper joked that it would be the end of his career. And here's an interesting scoop. 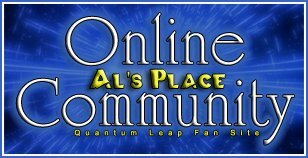 Stockwell said that a new Quantum Leap TV movie is being developed and would feature Sam Beckett's daughter as a new leaper. Stockwell said he too would be involved and hoped to get rolling on the movie sometime next year. I guess nothing is official, but there's a strong chance it is going to happen. Well, at least we know for sure now that Dean's planning to be involved in the movie, just as we'd been hearing about! Whoa! This is AMAZING!!! Thanks for sharing this with us, Joy. I can't wait to hear more! This is wonderful news! Thanks for picking up on this and sharing it with us, Joy! Well, the real credit goes to Claire from the Sassies. She's the one who found and posted the link on the Sassies Yahoogroup. Great to hear from Dean himself! It aiming for production next year explains why there was no mention in Sci-Fi plans for this year. I am glad Don has not given up on this. With the DVDs starting to come out, more and more people are remembering how great QL is and wanting to see more of it! This is the perfect time for a comeback! Finally. I was begining to think the idea had been scrapped. This is great news and I can't wait to hear more about it. I was over at the Magnum PI forum at tvtome.com where I first read a rumor that DPB is also making a Magnum telefilm in which good ole' Tom Selleck will be in. Looks like DPB is pretty busy. It would be great to see a Magnum and Quantum revivals. Actually I really want/need a Quantum revival and need just the seasons of Magnum on DVD. I posted that in the off topic realm. That's because I haven't seen most of the episodes of Magnum PI. So, is the Quantum revival really coming as soon as this fall? Although I never doubted the Telefilm was going to be made, I did have my doubts whether or not Dean Stockwell would be involved. Good to have it confirmed by him. It is worrying though to hear him state that it isnt 100% official yet that Bold Leap is going ahead. In relation to Magnum. Yes, they're making a film of it too. It won't be a telefilm and Tom Selleck isn't involved. Instead, it is being remade for the cinema screen and George Clooney has landed the title role. I hope it won't become a cheesy remake like other nameless examples. This is ONE HECK of a happy leaper! I've been thinking about something lately... Sammy Jo was born in 67...the QL project (Sam first leap) was in 1995 and 20 yrs from 1995 is of course 2015. Well Sammy Jo would be 47-48 yrs old. Way too old (if the audience they are trying to reach is a younger one) to be the leaper. Hopefully it will be a daughter from Donna not Sammy Jo that will be the leaper. Guess I'll just have to wait and see. Now, see, that's what I've been wondering about, too. However, does the "20 years after" in the Bold Leap Forward summary begin from 1995--when Sam first Leaped--or 2000--when Sam completely disappeared from the Project during the events of Mirror Image? Let's say that Sam and Donna conceived a daughter during the events of The Leap Back. That occurred in Sept. 1999, so the child would be born in 2000. If we take the "20 years after" as being from 1995, that would put us in 2015, and the daughter would only be 15 years old. That seems a bit young. However, if the "20 years" is calculated from 2000, that would make the daughter 20 years old... the perfect age for a lead role in a sci-fi series. Seeing as how this whole "20 years after" thing is coming into play, Sammy Jo seems to be out of the running. A granddaughter of Sam's would be plausible, but they've distinctly said it will be Sam's *daughter* Leaping. I dunno. I guess we'll find out sooner or later. i bet it's sammy jo, and i'd like it too. i remember a scene where sammy jo asks sam if he believes in miracles, and he says yes if time travell is a miracle, then she says i'd like to travel through time one day. could her role have been planned from before? If it's a different daughter, might it effect the QL: The Virtual Series (plug) continuity at all? Dean Stockwell's name has been added to the cast list over at the IMDB page for A Bold Leap Forward! Well, that's definitely a good sign!!! Thanks for the heads up! IMDb can't always be trusted, since it mostly gets its sources from volunteers (such as myself, not to say I'm untrustworthy ). I guess we'll see what happens in the coming months. I'm really excited to hear about this! I saw something about this on <a href="http://www.imdb.com/title/tt0383588/" target="_blank">IMDB</a>, but I thought this was just a poor guys wishful thinking. Lo and Behold: Dude, this is hot! Hey Everyone! I'm new to the board, but have found it to be very informative! However, I do have a question.....I never saw QL when it originally aired, (I was 7 when is began) but I fell in love with it when it began being aired on USA, however...I haven't seen all of the episodes (been watching them on the SciFi Network trying to catch-up!) Please explain to me who Sammy Jo is, and what episode we find out about her in. I have seen the episode where Sam and his wife are reunited, but did we meet her then? Sorry to sound so naive, but I simply haven't seen every episode and REALLY want to understand! Also...while I've read the movietimeline thread (very detailed by the way ) has ther been any word on where Scott Bakula stands with this idea? Seems like he wanted to be involved, but with Star Trek now...can he? Thanks for putting up with me!!!! We first hear about Sammy Jo in the 3rd episode of the Trilogy episodes from season 5. Trilogy (i) will be showing on Friday 30 July, 04 on my web site with the concurrent episodes following weekly thereafter (That's if my Video Card holds out. The last 2 captures I've done have been poor quality, so please accept my apologies).